In the event of inclement weather, check the website for cancellations. Cancelled classes will be made up at the end of the sessions. For serious wheel throwing and hand building students who wish to continue to improve their skills in a structured and supportive environment. Both group and individual instruction will be emphasized. Students will be encouraged to evolve a style of their own as they progress and focus on good form through practice and repetition. All-inclusive critiques will be periodically scheduled during class time. For students who have taken prior wheel and/or hand-building classes. Refine your skills through practice while you continue to polish and gain confidence in your foundational techniques. Students will be challenged to explore more complex items such as lidded jars, plates and altered forms while adding variety to their knowledge of surface options like slip, oxides and glaze. This class covers the basics of hand building and wheel throwing. Students will learn to work with pinch, slab and coil methods making a variety of functional or sculptural forms. They will learn to center on the potter’s wheel and practice making basic thrown pots. Students will learn basic glazing techniques. Students may take this class for multiple sessions to gain confidence and skill. 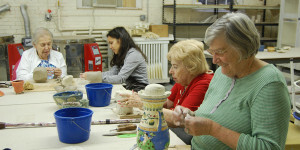 For students who have completed 8 weeks or more of ‘intro’ this class fosters a deeper understanding of clay and glaze. Students continue to hone both wheel and hand-building skills and are encouraged to bring their creativity to more complex projects. 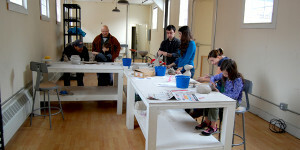 Our class for teenagers provides an introduction to wheel throwing and ceramic sculpture. Students will be encouraged to develop sculptural forms of their own design and master the skills needed to create these. 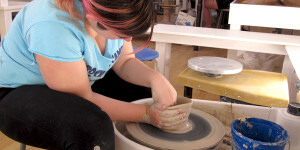 They will learn basic wheel techniques allowing them to create bowls, vases, and other functional forms. A great way for teens to build their 3-D portfolio! Basic glazing and firing techniques will also be covered. Ages 12-17. Learn basic hand-building techniques, such as pinch pot, slab, and coil. 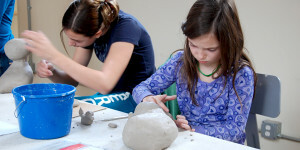 Bring your enthusiasm and ideas and explore what clay can do. No experience necessary. Materials included. *Price doesn’t include firing fee. Please refer to individual course description. Register online with our system. At checkout, click the option to pay offline, by check. Mail a check to the address below. Please make your check out to Peekskill Clay Studios. Checks must be received before the class begins. You will receive a confirmation via e-mail letting you know that your payment was accepted. Some browsers may not support our processing system, preferred browsers are Microsoft Chrome & Safari. Internet Explorer and Firefox have presented issues to other users. Tuition and clay fees must be paid in full before the first class (clay must be purchased from PCS). Students who wish to withdraw must do so one week before the first scheduled class to receive a full refund. Classes with insufficient enrollment will be cancelled and payment fully refunded. No refunds will be given for missed classed. Classes can be made up by permission of the teacher. Please look for information about weather related closing on our home page.